Unlike traditional bonds that pay a fixed rate of interest, floating rate bonds have a variable rate that resets periodically. Typically, the rates are based on either the federal funds rate or the London Interbank Offered Rate (LIBOR) plus an added “spread.” Similar to the federal funds rate, LIBOR is a benchmark rate used by banks making short-term loans to other banks. For instance, a rate could be quoted as “LIBOR + 0.50 percent;” if LIBOR stood at 1.00 percent, the rate would be 1.50 percent. While the yield changes throughout the life of the security as prevailing interest rates fluctuate, the spread (+0.50) typically stays the same. The frequency at which the yield of a floating rate note resets can be daily, weekly, monthly, or every three, six, or 12 months. Corporations, municipalities, and some foreign governments typically offer floating rate notes (FRNs). The U.S. Treasury also issues floating rate notes. Note that in the United States, FRNs are often offered by companies rated below investment grade. As a result, many floating rate funds have a similar degree of risk as high yield bonds funds, but without the high yield. Be alert to this potential risk before making any investment in a fund, ETF or individual security. Some diversified bond mutual funds also invest in floating-rate securities. Unless the fund is specifically designated as a floating rate fund, these bonds typically make up only a small segment of the portfolio. Managers often use them as a way to protect the fund when they expect that rates are going to rise. The advantage of floating rate bonds, compared to traditional bonds, is that interest rate risk is largely removed from the equation. While an owner of a fixed-rate bond can suffer if prevailing interest rates rise, floating rate notes will pay higher yields if prevailing rates go up. As a result, they will tend to perform better than traditional bonds when interest rates are rising. However, investors in floating rate securities will receive lower income if rates fall because their yield will adjust downward. Also, investors in individual floating rate bonds lack certainty as to the future income stream of their investments. In contrast, an owner of a fixed-rate security knows exactly what they will be paid through the bond’s maturity date. The best time to buy floating rate bonds is when rates are low, or have fallen quickly in a short period, and are expected to rise. Conversely, traditional bonds are more attractive when prevailing rates are high and expected to fall. 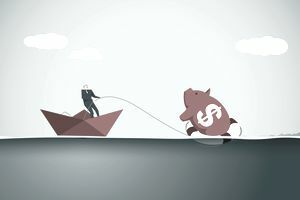 Floating rate bonds are also an attractive option for investors whose primary concern is to maintain a portfolio return that keeps up with the rate of inflation.